The MikroTik RouterBOARD RB260GSP is designed to seemly fit in as small SOHO switch. 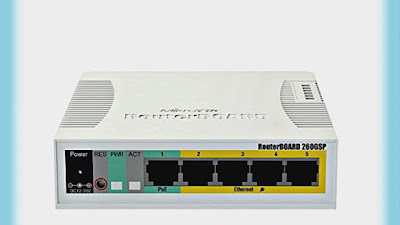 The RB260GSP features power output on it’s ethernet ports, ports 2-5 can power other PoE capable devices with the same voltage that is applied to the unit. The RB 260GSP has five Gigabit Ethernet ports and one SFP cage, The switching strategy of this router is done by an Atheros Switch Chip. The device runs an operating system designed specifically for MikroTik Switch products – SwOS. SwOS can be configured using your web browser. The MikroTik RouterBOARD RB260GSP offers you all the basic functionality for a managed switch, plus more: including the ability to manage port-to-port forwarding, apply MAC filter, configure VLANs, mirror traffic, apply bandwidth limitation and even adjust some MAC and IP header fields. The following devices have being tested and recommended to use with MikroTik SFP modules: S-85DLC05D, S-31DLC20D and S-35/53LC20D (not included). ← MikroTik 8 Port 1 SFP Port Cloud Router Switch, CRS109-8G-1S-2HnD-IN.